Sample uniforms in the various sizes are available at your facility. Please try on to confirm your correct sizes before ordering. Find a style that you are interested in. Click on any color swatch and see the color on the details sketch. If acceptable, type size, quantity and whether you want it monogrammed. If yes, type monogram as you want it to appear on garment. 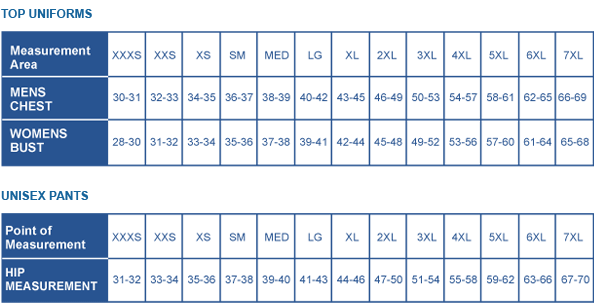 For sizing use the size charts below. If you have any questions please don't hesitate to call (877) 727-8289 or email us. Note: Please note that the Melrose comes in regular and petite sizes. The regular inseam is 30 inches. The petite pant inseam is 28 inches.